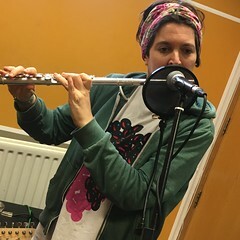 This Saturday lunchtime 6th May on Resonance FM we featured live music from Koral Society and Bad Parents. Ilia Rogatchevski discusses CRU2 with Lore Lixenberg. Gerry Mitchell reads poetry and composer Alan D. Boyd chats about Little Sparta, Waywords & Meansigns, Mekonville and The QC197 Songwriting & Music Making Collective. This entry was posted in dexter bentley, hello goodbye show, Hello GoodBye: Playlists, resonance fm and tagged alan d boyd, bad parents, CRU2, dexter bentley, gerry mitchell, hello goodbye show, koral society, lore lixenberg, misty miller, resonance fm. Bookmark the permalink.